Marcel Grossmann Meetings are formed to further the development of General Relativity by promoting theoretical understanding in the fields of physics, mathematics, astronomy and astrophysics and to direct future technological, observational, and experimental efforts. 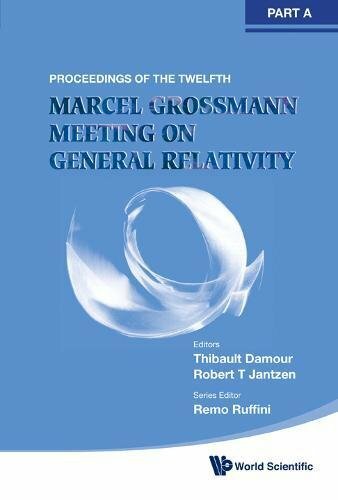 In these meetings are discussed recent developments in classical and quantum gravity, general relativity and relativistic astrophysics, with major emphasis on mathematical foundations and physical predictions, with the main objective of gathering scientists from diverse backgrounds for deepening the understanding of spacetime structure and reviewing the status of test-experiments for Einstein's theory of gravitation. The range of topics is broad, going from the more abstract classical theory, quantum gravity and strings, to the more concrete relativistic astrophysics observations and modeling.The three volumes of the proceedings of MG12 give a broad view of all aspects of gravitational physics and astrophysics, from mathematical issues to recent observations and experiments. The scientific program of the meeting includes 29 plenary talks stretched over 6 mornings, and 74 parallel sessions over 5 afternoons. Volume A contains plenary and review talks ranging from the mathematical foundations of classical and quantum gravitational theories including recent developments in string theories, to precision tests of general relativity including progress towards the detection of gravitational waves, to relativistic astrophysics including such topics as gamma ray bursts, black hole physics both in our galaxy, in active galactic nuclei and in other galaxies, neutron stars, pulsar astrophysics, gravitational lensing effects, neutrino physics and ultra high energy cosmic rays. The rest of the volumes include parallel sessions on dark matter, neutrinos, X-ray sources, astrophysical black holes, neutron stars, binary systems, radiative transfer, accretion disks, alternative gravitational theories, perturbations of collapsed objects, analog models, black hole thermodynamics, cosmic background radiation &amp; observational cosmology, numerical relativity &amp; algebraic computing, gravitational lensing, variable &#x201c;constants&#x201d; of nature, large scale structure, topology of the universe, brane-world cosmology, early universe models &amp; cosmic microwave background anisotropies, inhomogeneous cosmology, inflation, gamma ray burst modeling, supernovas, global structure, singularities, cosmic censorship, chaos, Einstein&#x2013;Maxwell systems, inertial forces, gravitomagnetism, wormholes &amp; time machines, exact solutions of Einstein's equations, gravitational waves, gravitational wave detectors &amp; data analysis, precision gravitational measurements, history of relativity, quantum gravity &amp; loop quantum gravity, Casimir effect, quantum cosmology, strings &amp; branes, self-gravitating systems, gamma ray astronomy, cosmic rays, gamma ray bursts and quasars.